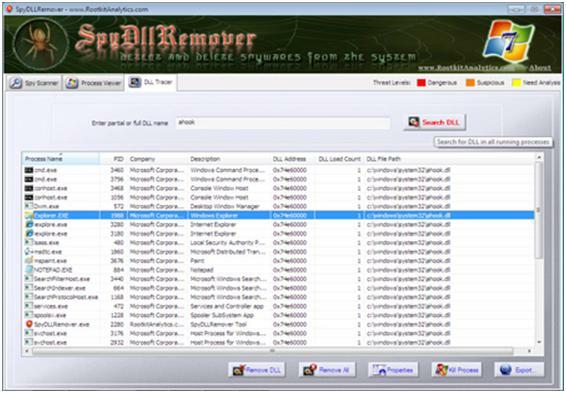 SpyDLLRemover is the standalone tool to effectively detect and delete spywares from the system. It comes with advanced spyware scanner which quickly discovers hidden Rootkit processes as well suspicious / injected DLLs within all running processes. It not only performs sophisticated auto analysis on process DLLs but also displays them with various threat levels, which greatly helps in quick identification of malicious DLLs. The DLL search feature helps in finding DLL within all running processes using just partial or full name. Then user can choose to remove the dll from single process or from all loaded processes with just one click. One of the unique feature of SpyDLLRemover is its capability to free the DLL from remote process using advanced DLL injection method which can defeat any existing Rootkit tricks. It also uses sophisticated low level anti-rootkit techniques to uncover hidden userland Rootkit processes as well as to terminate them. Here are some of the prominent and unique features of SpyDLLRemover which set it apart from any other tool of its kind. State of art technique for completely freeing the injected DLL from remote process based on advanced DLL injection method using low level implementation which defeats any blocking attempts by Rootkits. This is one of those unique features found only in SpyDLLRemover. Sophisticated DLL auto analysis which helps in seperating out the legitimate modules/DLLs from the malicious ones. Such DLLs are displayed using different colors representing various threat levels for quicker and easier identification. ‘Scan Settings’ option to fine tune the scanning operation based on user needs. Inteli-Refresh of ‘Process Viewer’ leading to flicker free user experience. Integrated online verification mechanism through ProcessLibrary.com to validate any suspcious DLLs. This makes it easy to differentiate between the spyware & legitimate DLLs. DLL Tracer feature to search for dll within the running processes using partial or full name. Then user can choose to remove the dll from single process or from all loaded processes with just one click. Support for malicious DLL removal from system processes across session boundaries breaking the limitations imposed in Vista/Win7. 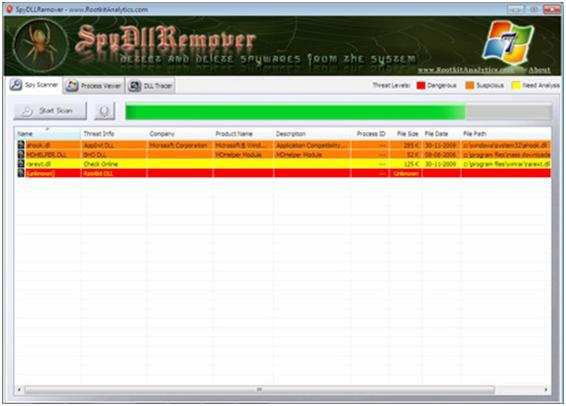 Here are the screenshots of SpyDLLRemover which demonstrates its effectiveness in detecting spywares and eliminating them with ease. Screenshot 1: SpyDLLRemover scanning the infected system for spywares and showing the malicious DLL injected by Vanquish Rootkit along with other suspicious DLLs. Screenshot 2: SpyDLLRemover’s newly introduced ‘Scan Settings’ which provides flexibility to user to fine tune the scanning operation. Screenshot 3: SpyDLLRemover detecting the hidden modules/DLLs injected within cmd.exe process by Vanquish Rootkit. 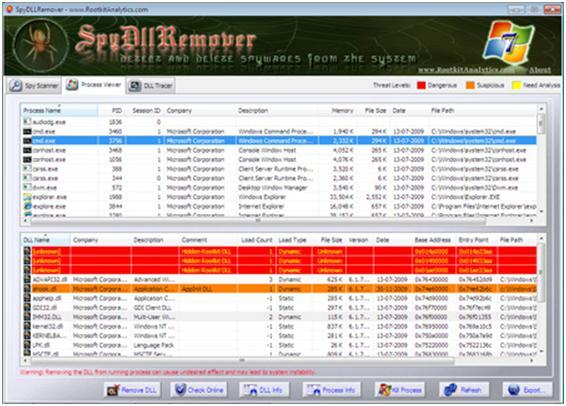 Screenshot 4:SpyDLLRemover’s ‘DLL Tracer’ feature showcasing the DLL search operation to trace the DLL within all running processes. Screenshot 5: Detailed report of Spyware Scanning Result in HTML format generated by SpyDLLRemover.